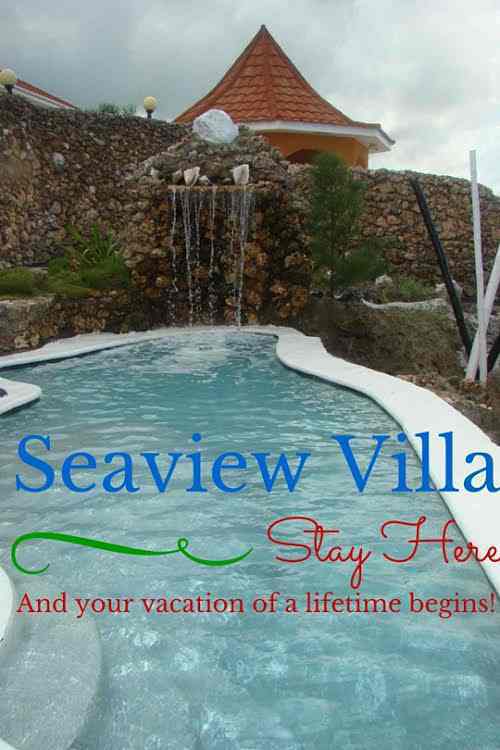 Caribbean-Art-Deco style gives Seaview Villas a flair that is not found in a typical Jamaican villa. Not only visually pleasing, it also gives you the ‘ahhh, I can breathe here’ sensation. After further exploration, you realize that the black and white of your surroundings is an excellent frame for the feature color, blue. The sea and sky stretch endlessly and seem more intense and beautiful upon this cliff-side refuge. The saltwater pools are architecturally created as part of the multilevel cliffside ambiance with a waterfall, fountains, shade and sun areas, outdoor shower, ample seating and hammock for your choice of relaxation mode. For supreme leisure, indulge in the rooftop jacuzzi alongside the convenient rooftop bar. And the view? 180 degree visual of the great Caribbean Sea and Port Antonio. Only ten minutes east of Port Antonio in the district of ‘Anchovy’, Seaview Villas feature two villas; the Seaview and the Banana. The Seaview is fully air conditioned, has three queen size bedrooms, three bathrooms, one with a jacuzzi tub, open living room floor plan including a beautiful loft with an extra bed, a fully stocked kitchen, and a laundry room. The Banana also is fully air conditioned and has three queen size bedrooms, three bathrooms, open living room floor plan including a beautiful loft with an extra bed, a fully stocked kitchen and laundry room. If you do not need quite so much space, a Seaview or Banana Guest Room is available, complete with shower room, fridge, microwave and laundry room. Available for your convenience is a staff of a cook, housekeeper, butler and private taxi. An exercise center, WiFi, cable TV and DVD are provided as extra measures to ensure every detail of your stay is the best it can be. Whether you’re looking into Jamaica for a destination wedding, family vacation or a getaway for two, Seaview Villas will make your trip into the forever memories you thought you could only dream of. You will congratulate yourself. Stayed here for a week and loved every minute of it. We hated to leave and will be back as soon as possible. Great view, great pool, great hot tube, great room, great food and great staff!! Perfect!